The new IMA production line guarantees a maximum of economy and flexibility. 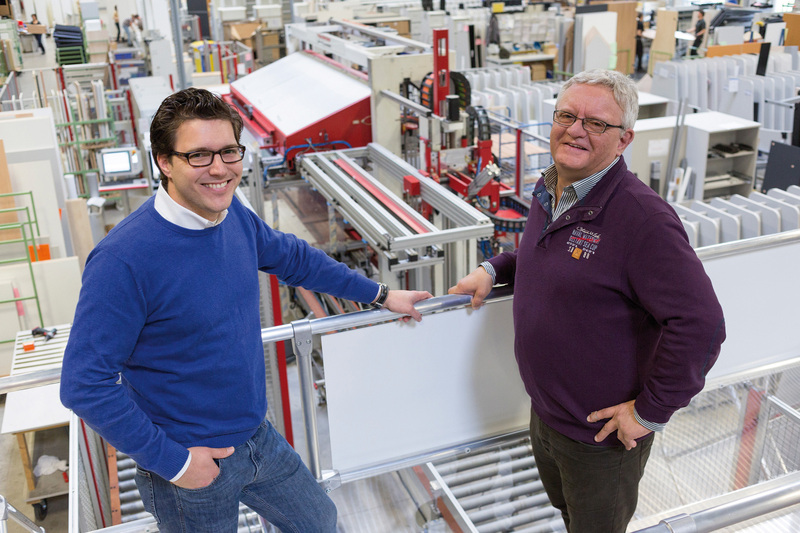 When the job is entered, the plant automatically starts supplying the raw panels from the high-rise storage system which has 280 stock positions for panels made from wood-based materials. Two IMA cutting centers of the type Performance.Cut saw the parts in accordance with the job data. “That means, fm Büromöbel has now switched to performing the entire sizing process in batch size 1 and in doing so is one of the first companies to use a Performance.Cut solution. In this process, the amount of waste is reduced by 20 percent. And hence, these cutting centers are not only more resource – efficient and cost-effective than conventional saws but also significantly increase the quality of cut”, IMA Managing Director Rüdiger Schliekmann explains. Product quality is further increased by the subsequent edgebanding of the components using the laser edging technique on two fully integrated through feed edge processing machines of the IMA Novimat type. Here, the laser technology allows for a jointless transition between edging and panel, simultaneously improving both visual appearance and product resistance as well as the functionality of the furniture component. In order to ensure consistent product quality, desk panels and other free-form parts are edgebanded on a new IMA work center of the BIMA Gx60 E type also using laser technology. Edgebanded components are buffered and sorted in the IMA sorting system. From here, the semi-finished parts are fed to the front drilling machine as well as to the carcase drilling and assembly line of the IMA network partner Priess + Horstmann for further processing and final assembly. The drilling and assembly line as well as the sorting and accumulation conveyor system were installed and commissioned in 2013 already. The other parts of the processing plant will be integrated and commissioned beginning in late 2014. The first element to be implemented will be the Horstkermper high-rise storage system for raw panels, followed by the installation of the IMA cutting centers, the IMA throughfeed laser edgebanding line and the IMA laser work center, all of this will be accomplished without inhibiting plant operation at fm Büromöbel. Landwehr, factory manager at fm Büromöbel. After the old equipment is replaced with the highly automated IMA processing plant as well as with the equipment from the IMA partners Priess + Horstmann, Horstkemper and 3TEC, the company fm Büromöbel will be able to produce and supply office furniture in record time.